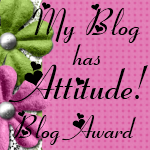 I would like to thank the lovely Sassy for passing on not one, but two awards to me! I am very honoured to receive them and pleased as punch too! 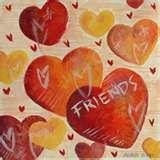 of these prizes are cut even more friendships are propagated. 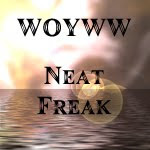 cleverly written text into the body of their award." 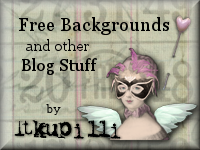 Now, I can't decide as I love all of the blogs I visit and who are listed in my sidebar. 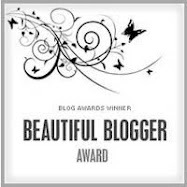 If you read this and are listed in my sidebar 'Blogs I like to visit' please take these awards away with you - you all deserve them. I'd also like to give the awards to Sassy, but as she gave them to me, that's probably not allowed! Thanks again Sassy my friend! 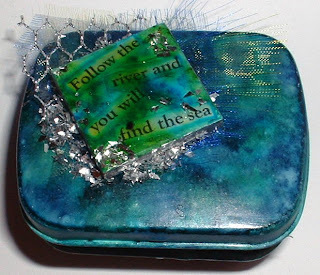 This month's challenge over on the GAS Flickr group (that is, group for altered art swaps)is to alter a tin using the sea as a theme. 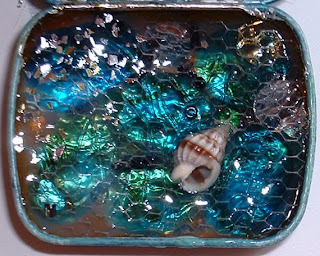 As soon as some altered tins started appearing in the photostream of the GAS group I felt suitably inspired as there are some gorgeous ones in there. This is what I did with the inside - much more interesting! the whole of the inside with it. 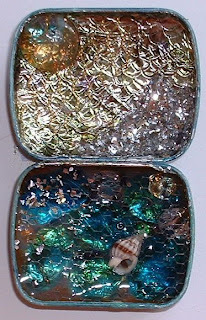 of mosaic fragments - not forgetting some more glitter flakes. I love the effect of the glass nuggets under the glaze and the alcohol ink colours on the bottom - I don't think the photo shows it off very well but I'm really pleased with the end result. Think I may go and buy some more mints now - burp!!!!!!!!!!! 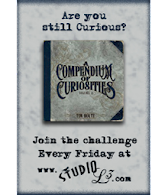 Ruler Book - Tim Holtz style! 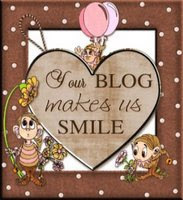 Ange's (Agnes The Red) latest project over on her Flickr group is to make a 'Ruler Book' a la Tim Holtz! 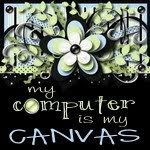 Ange has provided a great tutorial with step by step instructions and pictures which may be viewed here. 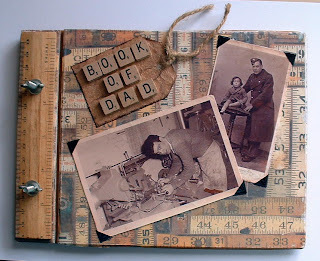 I decided to theme my book around my Dad - all his working life was in wood - he was a cabinet maker by trade. I remember a fantastic folding wooden ruler he used to have and when I asked him about it - it has mysteriously gone missing - hmmm, wonder if he guessed what I had in mind for it! Seriously though there was no way I would have cut that up! 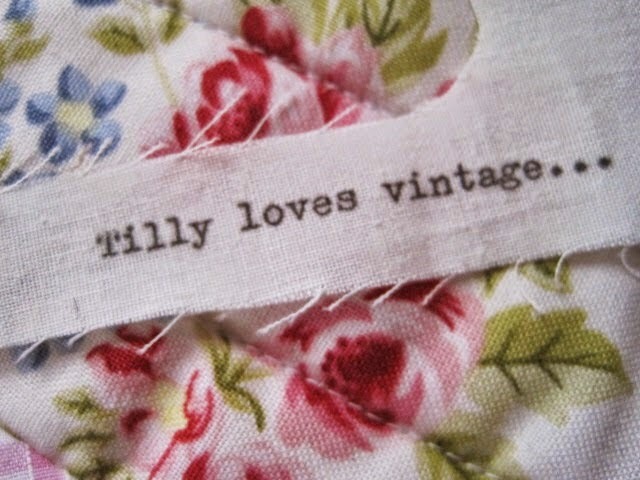 I ordered one off the internet - unfortunatly they all had centimetres on as well as inches, Ideally I would have liked one with just inches for a more vintage, authentic feel! One of my Dad's sisters recently emailed us some old photographs, many of which he hadn't seen before, or not for many, many years anyway. 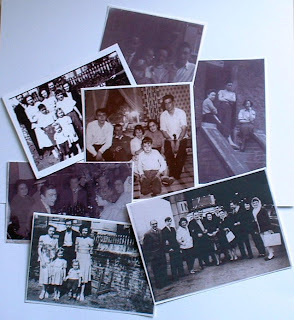 I thought it would be great to use these photos in the ruler book - I will ask my Dad to do the journalling in it. I love looking at all these old photos. The two on the front cover are my Dad in his late teens bending over one of the machines in the factory he worked in with his Dad and his older brother, and the other is my Dad as a baby with his Dad in uniform, taken 1940. When my brother was researching our family history several years ago he obtained copies of old birth certificates and found out that my Dad's grandfather was a walking stick maker - so it seems working in wood became a family tradition! I really enjoyed making this book - it's the first scrapbook of sorts that I've made for ages. Isn't she lovely - well, I think so, especially her wild hair! Being underwater most of the time plays havoc with your hair so I must recommend a good conditioner - lol! 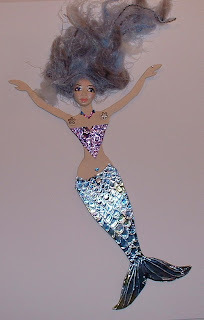 I've joined a new Yahoo group called Fantastic Flat Paper Dolls and this month's theme is 'Mermaids'. 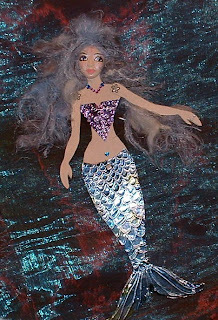 Well, I've never made a mermaid before but really enjoyed making the tail! The base is two layers of card (the back is covered with a scrapbook paper) and on the tail I used some self adhesive silver tape (I think it's what electrican's use, but for what I don't know!). I embossed it free hand to make a scaley effect then coloured it with a few different alcohol inks. I had trouble finding a top for her. 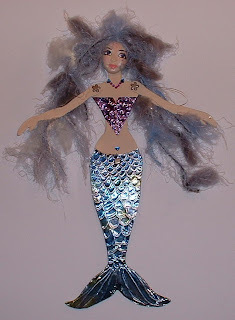 I wanted her to have a bikini top but couldn't find anything suitable (much like me when I'm getting dressed these days - lol) In the end I used some more of the silver foil and made her a little triangular shaped top. Her face is moulded for air dry clay and coloured with pens and chalks and her hair is some gorgeous fibres which are incredibly soft and fluffy. Another button fairy! This one is the sister to 'Yellow Wings' - see below. Her wings are made from card with some stuck on machine knitting (a scrap from my Mum!). Her face has been moulded from air dried clay then painted and inked. She wasn't going to be a 'goth' originally, but I sprayed on the gloss finish a little too early and all her make up smudged - doh! Don't you just hate it when that happens. So a goth she is, still I'm sure until they both fly to their new homes, 'Yellow Wings' will keep her in order - lol. 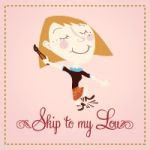 Yesterday I received, all the way from Canada a packet of 10 assorted charms for the 'Lucky Charm' swap organised by Kim on her group Paper Digital Art and Imagesbykim. Within our packets Kim included some extra goodies including some old sheet music, book text and beautiful vintage images. All the charms are different - and so lovely! If you look closely at the picture or click on it you may be able to spot them all. Kim maybe organising some more swaps in the future - I do hope so as I enjoyed making my charms (altered mah jongg tiles) but more to the point receiving all the returns! Meet 'Yellow Wings' she is a button fairy and my entry for this month's challenge on MAMMA's Monthly Art Doll (MAD) swap. 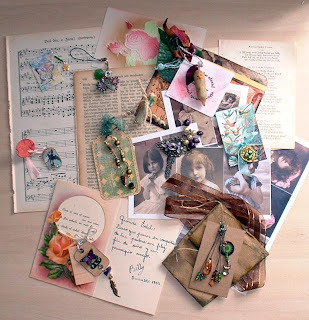 MAMMA (Margaret) has a tutorial on her blog showing how to make a fairy. My fairy has an air dried moulded clay face which I painted and made up. She has pink fibres for her hair, buttons for her body of course, and her wings are card with some bobbly cotton yarn glued onto. She can hang up by means of a beaded hoop. I like this little fairy and she will be hard to part with, but at least I know I'll be receiving in return a wonderful creation as everyone's work on the group is fab! 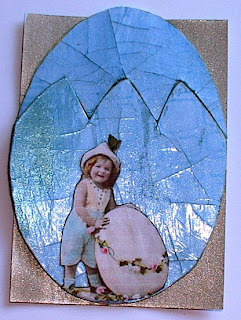 This week's theme over at MAMMAs Flickr group is 'Easter' and the challenge is to make an ATC using the template drawn by another member of the group Tracey AKA Angellea whose own ATC can be seen here. Once I'd figured out how to attach the top and bottom parts of the egg to the backing ATC (with ribbon sandwiched between card)I really enjoyed making my ATC - although it is rather plain compared with some of the others so far made on the group. For the outside I painted the egg with MiniMezze paint (Pacific colour). This is a lovely paint as it has a gorgeous metallic sheen to it. 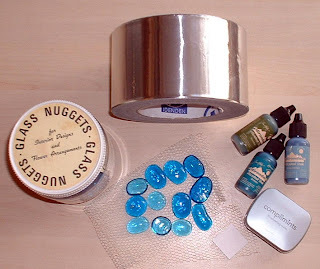 I then rubber stamped in a light blue colour all over, then coated it with a crackle glaze. Once that had dried and been cracked, I rubbed some metallic rub on so some of it seeped into the cracks. The outside was then finished off with a lovely vintage image from another collage Flickr group. Inside the image again came from the collage group. The egg was painted with Folk Art paint colour Taffy and lightly rubber stamped. 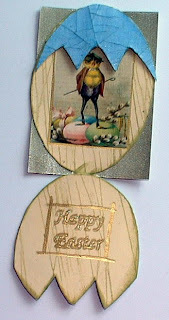 The Happy Easter greeting at the bottom was rubber stamped in gold and embossed. I'm thinking this template could be adapted to make other shapes - it's nice to make an ATC which holds a surprise for the receipient once opened up! I didn’t take a photograph of this card I made my Mum for Mother’s Day so had to borrow it back from her to take one! The background is rubber stamped with versamark ink and brushed over with some mica powder(in reality the green is a little deeper than it shows up in the photo). 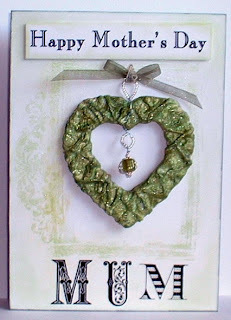 I printed out ‘Happy Mother’s Day’ and mounted it onto the card with 3d foam pads. The ‘MUM’ at the bottom is rub on letters. The heart is made from plaster cloth - I cut out a heart shape from card then covered it with the wet plaster cloth all over and moulded it to the heart shape. A few beads and some ribbon - all in Mum’s favourite colour - green, finished it off nicely. 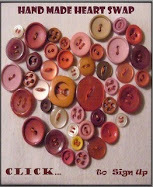 The heart is detachable from the card and can be used as a little wall or door handle hanging. I’m pleased to say she loved the card and we all had a lovely day - despite the fact that I cooked Sunday lunch for everyone which for once turned out half decent - lol.